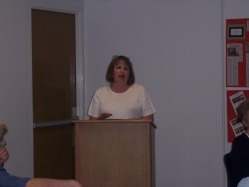 The Writers' Club of Whittier, to which I've belonged for more years than I care to admit, holds frequent outreach programs where we present our work to the public. Here is a sampling of some of them. 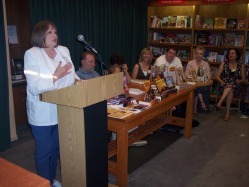 We had the pleasure of reading our work to a packed audience at Vroman's Book Store in Pasadena, California. If you're ever in Pasadena, be sure to check out this store. It's rated one of the top independent bookstores in the country. 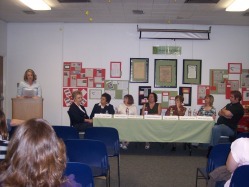 Several WCW members, including myself, had the privilege of reading our work in the Nixon Room at the Whittier Public Library. Each March is Writers' Month at the library, and the WCW has an exhibit of the work members have published in the past two years. The rest of us sit at the table while another member reads. For more information on the WCW, click here.